You can only address the intricacies of human relationships in metaphors – use specific terms that would only discuss them scientifically and you’ll break them apart from the very wolrd they’re supposed to link us to. I was giving myself that speech in almost-semiotics while I was walking home from a class on painting conservation. The metaphor that flickered in my mind linked where I had left from to where I was heading, the art world and my lover. There’s two ethical approaches to art restoration – one tries, through painstaking research and in-depth analysis, to get the object as close to its initial state as possible and reveal something that reaches all the way back to the freshness of Michelangelo’s last brushstroke. The other approach is resigned with the sheer impossibility of recovering the exact look of Mona Lisa when Leonardo finally rubbed his hands and said ‘Good job!’ (which he probably never did). I was told nobody could decide if either was right or wrong. No wonder, you see – the question itself is wrong. One would much better ask what they want the artwork to convey and figure out which process best suits their desire. I think we’re all faced with this dilemma quite often, actually. In our relationships, in our friendhips. And we need to choose which is to be our approach – constant regeneration of the period when we’ve been most satified with the way we worked together? Acceptance of the fact we’re never going to be like that again? Harking back to the values which had initially brought us together? Adopting new values that fit our present state? And what about the marks scratched into us? Should we cover the wear and tear of time? Should we keep it on display as a striking testament of particular experiences? Is the essence of our relationship more important than all the different types of growth processes around it? Or the reverse? 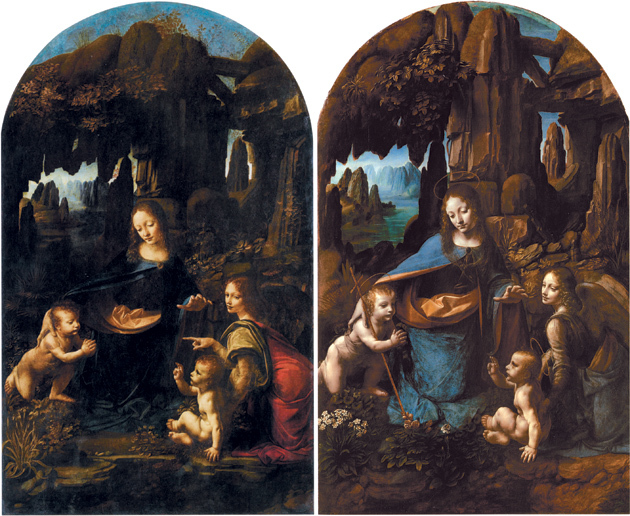 Look at Leonardo’s two versions of the ‘Virgin of the Rocks’, one in the Louvre,the other in the National Gallery in London – one preserved with (almost) all the dust of centuries lived through, the other restored to give us a cleare (and cleaner) sense of da Vinci’s real vision. Which one resonates with you? I prefer the first image, mostly due to the deep red of the robe of the woman at the right of the frame and the darker tones, overall. The cleaned up version seems dull and lifeless by comparison. I wonder if they really have restored it to the way Leonardo left it? As much as they could, they tried to get it back to the way it should’ve looked when finished. But, of course, these photographic reproductions don’t really do justice to either – they both look much better when you’re in front of the original, especially the more restored version. I am lucky to have seen both versions in situ. I remember being totally blown away by the London version, as much for the size and the fact it was in London. I was 24 and had not the faintest idea any of Leonard’s works were in Britain. I nearly passed out with excitement, and there was also the cartoon of the same Virgin of the Rocks, not to mention the other works. Great post. Very thought provoking to link art restoration to personal relationships. I personally prefer the London version myself – interestingly, though, it’s the more restored one, as the ethics of conservation in the UK are of trying to strip down the layers of dusted varnish up till the first layer of colour.